Vivus Architecture + Design » Archive » Join me at the Energy Design Conference! Join me at the Energy Design Conference! 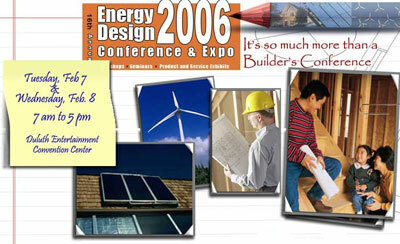 I’ve just registered for the 16th annual Energy Design Conference in Duluth on February 7th and 8th. This will be a great opportunity to learn more about integrated building design and energy efficiency and to network with people also interested in sustainability. Carpool? I’ll be heading up early in the morning on Tuesday and taking a hotel Tuesday night, then returning Wednesday evening. If you would like to join me, drop me a note! Posted in All Entries Comments Off on Join me at the Energy Design Conference!